And so it begins… the first lap of the CMJ marathon landed me in the East Village last night until 3ish, starting with Long Island band Wild International at Webster Hall. 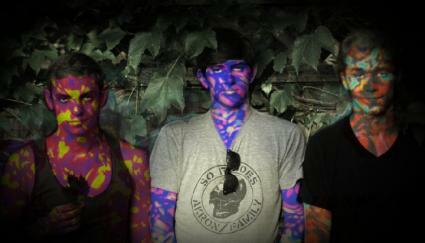 Wild is a group best described as what Panda bear might sound like were he in a punk band. This three piece moved from jangle to thrash in equal measure and even premiered a brand new song, ‘Creeks’, complete with water sound effects and campfire croons. But by far the best thing Wild International might have been guitarist Ryan Camenzuli’s mom, who was really cool and could have been an Animal Collective fan herself - we all need cool and supportive mothers at shows! Next up was Mainland. Singer Jordan Topf wins the award for wearing the tightest pair of jeans of the night, and his band's sound was an equal match. Absolutely one of the most enthusiastic of the night’s groups, their dexterous bassist reacted so joyously to each song’s change you’d think he was more their fan than bandmate. Despite their numerous soundchecks, including a couple broken strings, they powered through in no small part to the young lead singers’ boundless energy. And that was it for Webster Hall. After grabbing a quick slice at South Brooklyn Pizza shared with CMJ artist/East Village insider Emily Greene (playing tonight at Spike Hill! ), I hurried over to the No Pulp CMJ show at Arlenes grocery to catch (pictureless) glo-fi torchbearer Adrienne Drake bring the romance. This shoe-gazey songwriter swings a big wall of circuitry at melodrama and makes quirky throwback synths dance-ready. Think Ariel Pink covering The Cure. Next up was a band competing with Click Clack Boom for the comic book-ready band name of the night: Blip Blip Bleep. This Brooklyn-based power pop trio opened with a song to make me wish to god it was Friday already (though not in a Rebecca Black kinda way). Giving The Pains of Being Pure at Heart a run for their money, this three piece put more sounds into their keyboard-backed anthems than most bands twice their size. This included generous doses of Ableton Live, and I should also mention that their very attractive keyboardist Kayce McGehee had two very well endowed mini-korgs of her own to frame her figure. Their cover of ‘Beat It’ was made all the sexier when she turned it around into a feminist disco anthem. Finally the evening came to a close with Brooklyn’s Deathrow Tull. Here’s a band that has their thing down, with every moment carefully choreographed to the smallest detail. An incredible exercise in jazz/ hip-hop style democracy you don’t usually find in covers of ‘Let's Get It On,’ There was an excellent juxtaposition here between the smooth soul of Temple Grindin’s soprano, and Broke and Dyalekt’s hard-edged rhymes. It was a sweaty end to my first lap of CMJ, and I can’t wait to get back out there tonight.